Factory Reset Protection "FRP" for Samsung newly released Android Lolipop 5.0, 5.1.1 higher galaxy phone comes out with Find My Mobile option. 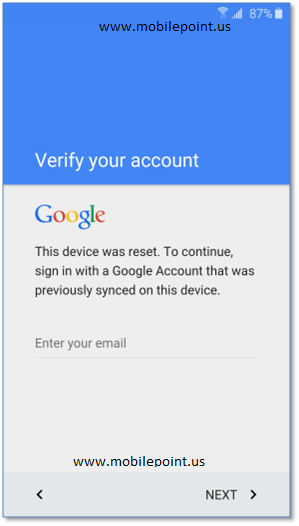 That's why first time used Google mail id verify that this owner of the phone. Get successfully installed this application and then restart. Then get Samsung Android mobile prepare like brand new condition. A800I, G9200, G9208, G9209, G9200A, G920AZ, G920D, G920F, G920FD, G920FQ, G920I, G920K, G920L, G920R4, G920P, G920S, G920T, G920T1,G920V, G920W8, G9250, G925A, G925D, G925F, G925FQ, G925I, G925J, G925K, G925L, G925R4, G925S, G925T, G925V, G925W8, G925Z, G9280, G9287, G9287C, G928A, G928C, G928F, G928G, G928I, G928K, G928L, G928P, G928S, G928T, G928W8, N9200, N9208, N920A, N920C, N920F, N920G, N920I, N920K, N920L, N920P, N920S, N920T, N920W8, A800F, A800IZ, A800S, A800YZ, G150N0, G150NK, G150NL, G150NS, G155S, G361F, G361H, G361HU, G531F, G531H, G531M, G903F, G903M, J110M, J200BT, J200F, J200G, J200GU, J200M, J200Y, J500F, J500FN, J500G, J500H, J500M, J500N0, J500Y, J700F, J700H, J700M, N910K, N910L, N910S, T350, T355, T555, T555C, T715, T715C, T715N0, T715Y, T810, T815, T815C, T815N0, T815Y, T817, T817W.